The Skangas bunker vessel Coralius continues it adventurous journey into Liquefied Natural Gas (LNG) refueling at sea by cooling down the recipient vessel’s tanks and delivering LNG in one operation, another first. 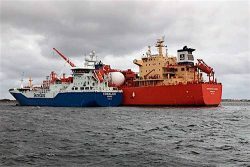 The receiving vessel LEG/C Navigator Aurora was supplied with just under 500 mt LNG in the middle of a voyage between Sweden and South Europe. The successful operation was carried out at Danafjord outside Gothenburg over the weekend. Going from using diesel oil to LNG requires a cooling down operation of the receiving ship’s fuel gas tanks from ambient conditions to minus 160 degrees. This operation is time consuming but necessary. The Navigator Aurora’s design allows her to pre-cool her fuel gas tanks before LNG spray is introduced, reducing the cooling down period considerably. All in all, this first bunker operation took less than 24 hours with the transfer of the main parcel taking 6 hours. Bunkering of Navigator Aurora was different from previous bunkering operations since it included the cool down operation. The operation that took place over the weekend is a milestone for the industry and proves that with careful planning and teamwork, this type of operation where LNG bunkers is supplied to vessels whilst transiting between ports, is not only efficient but also very safe. In addition, this was Coralius’ largest bunkering done so far. “The LNG cooling and bunker operation is a first for us and we spent lots of time in the planning and execution with all stakeholders to get it right. We are very happy with the result and hope to be able to use the experiences we have gained to support the industry also going forward,” says Tommy Hjälmås, Director of Newbuilds and Special Projects at Navigator Gas. LNG is the cleanest available marine fuel, one that is rapidly becoming more commonly viewed, and used, as a cost-effective alternative. LNG is suitable for all vessel types, including ferries, passenger ships, tankers, bulk, supply and containerships. LNG offers several benefits by reducing local pollution and preserving the global environment. Switching to LNG completely removes SOx and particles, and reduces NOx emissions by up to 85%. In addition, LNG reduces CO2 emissions by at least 25%. Use of LNG as marine fuel also results in compliance with current and forthcoming IMO and EU regulations.